Let's get those Turkeys gobbling. Justascrappin' weekly Challenge! 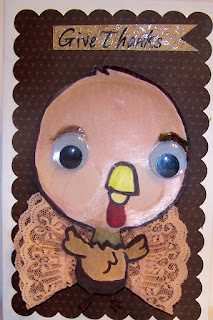 Nov. 22 Make a Thanksgiving card, layout or 3D project. Use any color but add some lace. 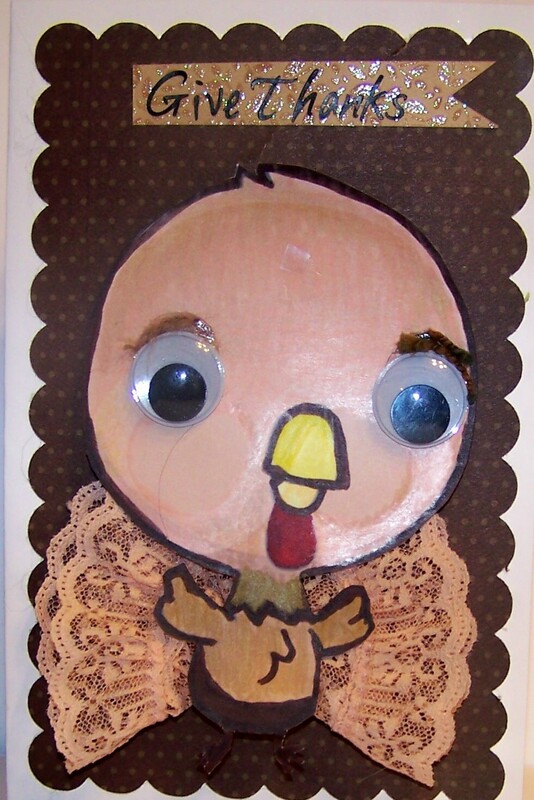 I used a free download for my turkey then cut and colored her last adding fiber eyebrows and google eyes. Added orange lace for feathers using a jumbo Zot behind her back sticking the lace into a circle. I cut a <rctngle2> at 5 inched from Art Philosophy Cricut cartridge for the background on white card stock then used letters from stash to say "Give Thanks" on the title. Join us at Justascrappin' weekly Challenge and Let's get those Turkeys gobbling! Just love those googlie eyes! He's such a little cutie! TFS.